The Dhubri district administration on Saturday ordered a magisterial inquiry into the matter of wrong information on Bihu festival in a book titled, ‘Xohoj Byakoron and Rosona Part-2’, written by ‘Bhuyan and Mollah’ and published by New Mohmodiya Pustakalaya of Dhubri town. 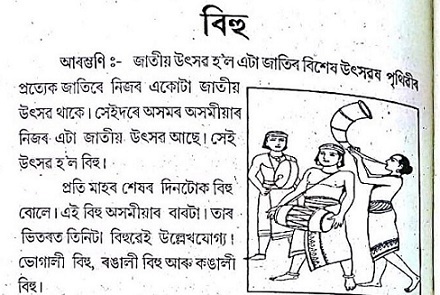 In the book, which is a guidebook for school students, it has mentioned that “the last day of each month is called as Bihu. There are 12 types of Bihu. Of these, three Bihus namely Bhogali Bihu, Rongali Bihu and Kangali Bihu are important”. It may be mentioned that Bihu refers to only a set of three different festivals of Assam: Rongali or Bohag Bihu observed in April, Kongali or Kati Bihu observed in October, and Bhogali or Magh Bihu observed in January. Bistirna Barua, Executive Magistrate, Dhubri accompanied by Bikash Sarma, DIPRO, Dhubri conducted a raid in the New Mohmodiya Pustakalaya located at NS Road of Dhubri town and seized the copies of the objectionable book on Saturday. “We will submit a detailed report to the Deputy Commissioner, Dhubri for further course of action,” said Bistirna Barua, Executive Magistrate, Dhubri, who led the inquiry team. Earlier, on Friday, a number of organizations including the All Assam Students’ Union (AASU), the All Asom Jatiyatabadi Yuva Chatra Parishad (AJYCP), the Asom Yuva Parishad and the Dhubri district unit of Asom Sahitya Sabha condemned the publication of the book with wrong information and expressed their grave concern over the matter. The organizations also submitted a memorandum to the Dhubri Deputy Commissioner and demanded immediate arrest of the writers and publishers of the book besides imposing a ban on the books’ sale. The organizations alleged that the publishers and writers of the book were trying to tarnish the image of the State’s festival by providing distorted information to school students. Eunish Ali, publisher of the book, had apologized for the mistake before the media on Friday.